Blake and Liane have known each other since they were children. Their families spend their summer holidays on Sanibel Island. Seeing her best friend Blake is the highlight of Liane's year. They call and write each other letters and they're really close. When they are eighteen they spend a very special summer together and they're making plans for their future. They feel like they are each other's soulmates. Only the question is if their happiness will last and if they have a future together? Twisted Souls is an emotional story about two people who are made for each other. Blake and Liane have such a special connection. Only this story isn't all about simple romance. Blake and Liane go through a lot, both together and apart from each other. Some of the scenes in this book are heartbreaking. I regularly had tears in my eyes. I knew something big was about to happen to the two of them and kept wishing it wouldn't. I immediately loved the two main characters of this book. I met my soulmate at a young﻿ age and know what it feels like. It's exactly how L.L. Collins describes it. She knows how to write about love, both the beautiful parts and the agony that it sometimes results in. 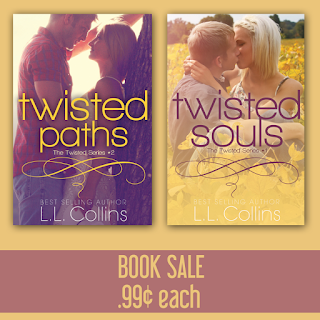 Twisted Souls is an amazing story about love, loss and betrayal. L.L. Collins has a sympathetic way of writing about problems which I liked a lot. I'm glad I was able to read Twisted Paths straight after finishing Twisted Souls as it would have been extremely hard to wait and see how Blake and Liane's story would continue. I absolutely loved this book and had to know more about them. Liane thought she'd chosen well and that she has the life she's always wanted. Her special summer with Blake was eighteen years ago. Liane is a teacher and Blake is a business owner. Life hasn't been easy for them. Liane has to make some difficult choices again that might finally lead her to a happy life. What will she do and will she have a chance to have a good and loving future? L.L. Collins tells her stories from different points of view. That way the reader has the chance to get to know both Blake and Liane very well. I liked that a lot. I enjoyed looking into their hearts. Twisted Paths is again a story filled with difficult moments. There's sadness, but there's also joy. I couldn't wait to find out what Blake and Liane's future would be like. I love books about soulmates and therefore couldn't wait to read this series. I loved both stories equally and it's fun to read about the same people when they're teenagers and when they're in their thirties. I like the idea and think L.L. Collins has written a fantastic history of two people who love each other more than anything in the world. Life isn't always kind, so there are many obstacles on their paths. I loved the ending and shed a few tears when I read it. Liane and Blake are in my heart, they're amazing main characters. L.L. Collins is a good story teller. I love that she can describe emotions in so many different ways. Her main characters aren't always strong, they are human and they make mistakes. That only made me like them more. If you're looking for a good romantic story with a lot of depth I highly recommend the Twisted series, it's really great.